A circle of sisters is a safe place to bring all of ourselves. A circle of sisters is a mirror. A circle of sisters is a cheering audience. A circle of sisters is a place to receive the next puzzle piece. A circle of sisters is an invitation to come into the present moment. A circle of sisters is a vibrant environment for cross-pollination. A circle of sisters is a bowl of warm, nourishing soup made with love. A circle of sisters is a hothouse for our fledgling gifts and talents. A circle of sisters is our birthright. A circle of sisters is a witness to our unfurling and refolding. A circle of sisters is a place to call home. A circle of sisters sits with us with what is. A circle of sisters goes with the flow. A circle of sisters is a place to listen and realise in the process you have been spoken. A circle of sisters is where the mysterious language of our energetic bodies exchange, reconnect and heal. A circle of sisters is where we are truly held to let go and be seen. A circle of sisters is an ancient rite that we are remembering. A circle of sisters is where we rest back and reconnect to the joy of being. A circle of sisters is where we sing, cry, and speak as loud or as soft as we want to. A circle of sisters is where you tenderly gather yourself in and tend to your innermost needs. A circle of sisters is where you feel the sweet embrace of Sisters. A circle of sisters has no beginning and no end, it is a symbol of wholeness, of the Soul and a metaphor for the cycles of life. A circle of sisters is a place in which to look at my wounds and to be in the healing of these. A circle of sisters helps me feel I belong to life even when I feel so separated. A circle of sisters dares me to connect and to keep returning to connection, to self and to others. A circle of sisters forms the heart of community. 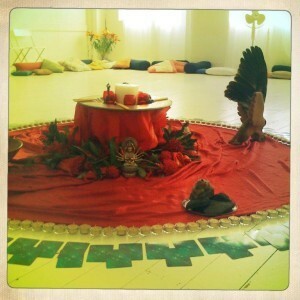 A circle of sisters becomes a place where the young ones learn about the sacred. A circle of sisters celebrates and honours rites of passage for all their kin. Thankyou, dear sisters, for dreaming these words into being with me!